William and Ailsa Stonor are keen to ensure that Stonor Park continues to be a destination for the whole family to enjoy, they wanted to create somewhere that is safe and engaging for the youngsters, hence the concept of the adventure Park was conceived. 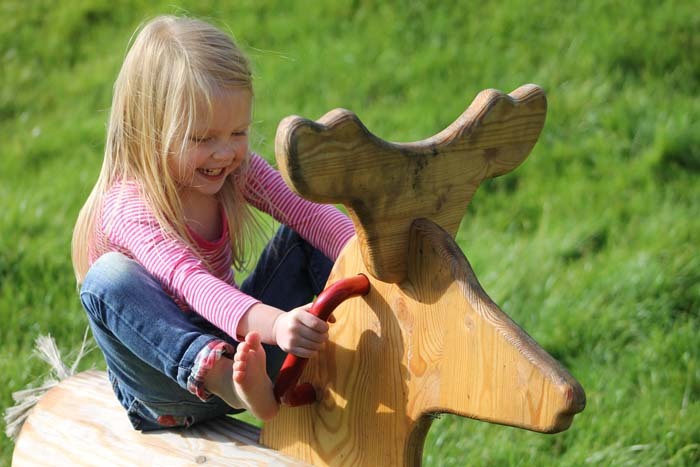 Timber play, the brilliant people behind the Diana, Princess of Wales, Playground in Hyde Park, were invited to create a play area that would enhance the ambience of Stonor Park whilst ensuring the design was sympathetic to the wood and park land. The brief was to create a stimulating and fun environment for all children up to the age of 15. For the younger children, Stonor Park have created a play area with a raised play house and slide surrounded by soft sand, leading to the water pump where children can divert water through channels and water wheels. Plus see-saw, wobble dish, rocking fallow deer (a nod to the fallow deer roaming the park) and swings are close by. Further into the woods older children will see the wooden climbing structure that leads to a rope climbing forest, connecting to a tree house with slide. A 50 metre zip wire and tunnels adding to their fun. Wonder Woods is located on the edge of woodland, the wooden and steel structures are designed to embrace the grassed landscape, and as new saplings take root and grow this truly becomes a wooded wonderland. Lots of seating has been created close by including picnic tables and benches, with some natural seating made from parts of an enormous sycamore tree felled in Stonor Park. The Pit Stop café is close by too, offering coffee, drinks and artisan snacks for the whole family. Bathrooms and baby changing facilities are adjacent to the café. With the Wonder Woods loyalty card, visit five times and get your sixth visit absolutely FREE.